Last month, Secretary of the Interior Ken Salazar revealed a special-edition Duck Stamp envelope available for $25. The "cachet" costs $10 more than the annual Duck Stamp because the proceeds will go toward conservation efforts in the Gulf of Mexico, fouled by BP's oil gusher, and specifically toward purchasing land that will become part of national wildlife refuges along the Gulf. 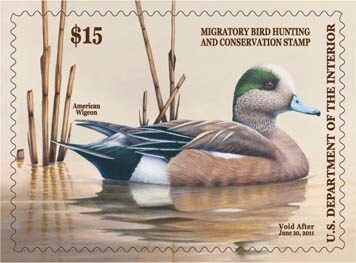 The cachet features a silk rendering of an award-winning photograph of St. Marks National Wildlife Refuge on the Gulf Coast of Florida [not shown -akh] by David Moynahan and the 2010-2011 Federal Duck Stamp [below], which depicts an American Wigeon painted by artist Robert Bealle of Waldorf, MD. Since 1934, Federal Duck Stamp sales have raised more than $750 million to acquire and protect more than 5.3 million acres of wetlands, including habitat on hundreds of the 552 national wildlife refuges spread across all 50 states and U.S. territories. You might see the envelope called "Gulf of Mexico Wetland Commemorative," "FDS Commemorative Silk Cachet" or FDS11NWR. The website says it currently is out of stock, but you can download a form to pre-order the envelope. Note: Shipping is $5.95 for one stamp, $7.95 for two. The oil gusher appears to have stopped. The need to help that tainted environment -- and the birds who need healthy habitats -- continues.